Yes, Jesus was at Pantheacon. I am not talking about christian forms, although there were plenty of those. At the Old Time Good Spell Feri Pagan Tent Revival (did I get the full title?) I raised my hands along with everyone else, sang “Give me that old time religion” and “I’ll fly away” and shouted and fanned myself with the glitter-fan and clapped and listened and was touched. While the irony of using a distinctly American evangelical christian expression at a pagan gathering was a source of great amusement, the ritual felt less like a mockery and more like a syncretic liturgical experience combining hilarity with reverence. The skillful integration of christian elements into pagan worship was stunning. I could have coped with christian elements, with inter-faith dialogue, the appropriation of Christian forms of worship, the surprisingly friendly attitude of many pagans toward Christianity, the discovery of a syncretic christian-pagan religion in the South. But I was not prepared for Jesus himself to show up at a christopagan ritual. On Monday morning we cast a circle and then we called to Jesus. I almost cried when I sensed the presence of the one I gave my heart to as a child, who walked with me through my Jesus Freak years, who seemed to abandon me in my marriage, and who carried me through the Dark Night back into the light. Jesus was there and we celebrated his love, received an anointing with oil, and shared in holy communion. Today, nearly three weeks later, I am still processing Pantheacon’s syncretism and diversity and all of its theological implications. Christopagans worshiped with Conjure witches, heathens, Gardnerian Wiccans, celtic Druids, and atheistic pagans. I saw many of the cultures of christendom reflected in pagandom; the druids turned out to be “episcopagans”, the OTO folks reminded me of Roman Catholics, the Sparklers celebrated like Pentecostals, the heathens had a thoroughly Lutheran feel, and the Reclaiming and Feri folks felt familiar like emergent evangelicals. And somehow, miraculously, they all disagreed, got annoyed and made fun of each other, and mostly got along. “An Anglican, a Pentacostal, and a Baptist go to church together” sounds like a set-up for a joke – or a disaster. Pentecostals believe Anglicans aren’t real Christians, Baptists think Pentecostals have demons, and Anglicans consider them both ridiculous. “A druid, a wiccan, and a heathen go to ritual together” sounds like business as usual at Pantheacon. The absence of demons, the presence of Jesus, the incredible diversity amazed me. And yet none of these were as shocking as my own very personal experience. I went to Pantheacon by myself in hopes of meeting interesting new people. Those hopes very certainly exceeded. In my typical uninhibited blunt fashion I contacted a pagan writer before Pantheacon, asking to meet him in person. He agreed and we had lunch on my first day of the conference. To my surprise I felt neither like I was imposing on him, nor did I get the impression that I was the sole beneficiary of our conversation. When I started to make my way into the Christian writer-speaker scene a few years ago, it always seemed like I was imposing and struggling to have my voice heard. Over the course of the conference I ran into him again and met other writers and thealogians. I had conversations about how aspectual polytheism relates to dispensational eschatology and other über-nerdy subjects and felt right at home. In fact, I had not felt so at home since my teenage years. The sense of belonging was completely startling and culminated in my most shocking discovery. I was sitting in the hospitality suite of the Covenant of the Goddess. A number of writers and leaders of various kinds were sitting together chit-chatting. The conversation turned toward a certain branch of christianity that I am familiar with and I joined in. Eventually I found myself telling my own personal story. I talked about my religious journey, my failure at being an atheist, and some of the bizarre spiritual experiences I had early in life. And no one batted an eye. No one was startled. No one wanted me to justify or validate what I said. I was accepted and respected. And I was shocked. I was shocked, because here, in this group, on this brand new path, my voice was heard, my thoughts respected, my uniqueness accepted. I could have cried for joy and then for all of the lost years of over-explaining myself, pleading to be heard, struggling to breathe. That moment at Pantheacon, when I sat in the overstuffed chair and experienced what it was like to be respected as a woman and a theologian reminded me of a day four years ago. A day in which I sat on the couch in my apartment and realized that I had spent almost a decade in an abusive marriage. The sense of loss and liberation was like crashing into a wall, my head ringing for weeks afterwards. Pantheacon left me shocked in a similar way, only this time the loss is already fading quickly in light of the power and wonder I have gained. This entry was posted in christianity, paganism, religion and tagged christianity, jesus, paganism, pantheacon, syncretism. Bookmark the permalink. And indeed you do soar, my dear. Thanks for this lovely post. 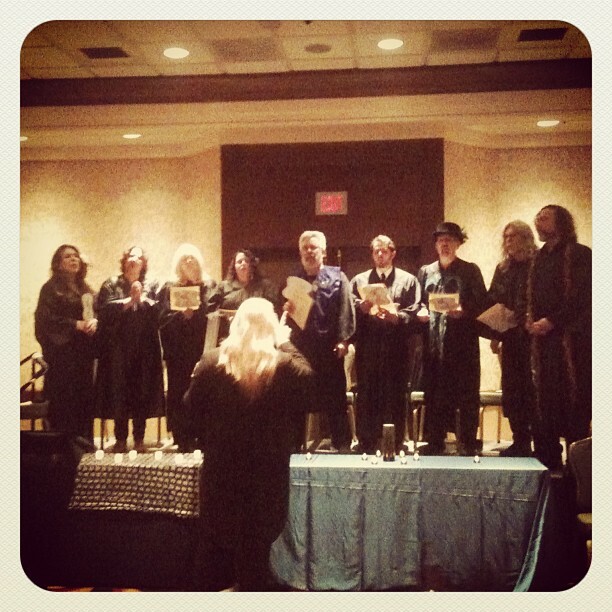 I am the man with the beard in the center of the picture of the Blue Fire Choir, and Angus is the man with the flowing hair directing us in front of the alters to the Star Goddess and the Mighty Dead. I’m glad our rite touched you in such a visceral way. Thanks for your kind words about the Revival! I’m so glad you enjoyed it. I would be happy to speak with you further about your experience there. I should say that this event (and indeed, some of the concepts presented) are not representative of Feri as a whole. That may seem obvious to some, but we’ve had that confusion happen before. The power of the form is undeniable, though, and we’ve had many people tell us that this ritual has helped them reintegrate parts of their religious past that they’d thought were irredeemable. you were absolutely fabulous at the Revival! I didn’t expect it to be representative of Feri, but I also didn’t expect it to have so much depth. As I was reflecting on the event, I imagined a time in the distant future in which we have become barely remembered ancestors and our practices are debated among historians. I pictured a group regularly celebrating pagan tent revivals and scholars arguing over its origins, some insisting that it originated at an early 21st century convention in California, others providing evidence that it actually goes back to a Christian practice common in the 20th century. What a wonderful story about Pantheacon as a whole and your personal journey. I was also in the Blue Fire Choir. I am so happy to welcome you into the pagan community. I was also raised with Jesus(Southern Baptist) and feel connected to him as well many goddesses and gods. I hope to see you next year. Bright Blessings. Wow, I had no idea faith gatherings of this sort even existed. How cool!